Are you ready to refresh your presentation skills and to gain new stimuli? Build up strong lines of arguments and present your projects and ideas successfully? You can learn to convince – with the Lilit Presentation & Negotiation seminars. 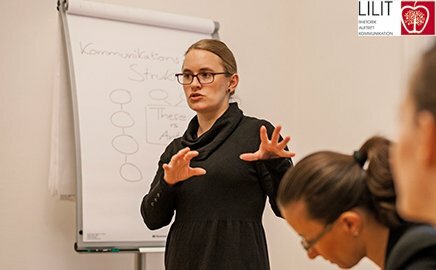 Learn from the German Debate Champion Marietta Gädeke about the tips and tricks of persuasion through strategic empathy. Experience active exercises, case studies and fresh input with real practical orientation and simulations. With Lilit, you will gain the necessary confidence and radiance to achieve your goals. We design our seminars to offer you intensive training on various levels of difficulty. Book our components according to your stage of skills and your needs – successively or independently from each other. Use the decisive advantage of credibility, argumentation and emotional address – either for negotiations, for committee meetings, or in a public debate.